Oddly, the hardware is here well before the software. In a touch demo above, only Reaktor really made sense to demonstrate – though it makes a terrific demonstration. Reviewer Josh Morky is even impressed as a Mac user. See his full review below, but the PC industry seems poised to give him nothing if not hardware options. Companies are making bigger tablets, full-sized displays with touch, bigger laptop/tablet convertibles, and so on. I got some time to play around with the Acer Aspire P3 tablet in Taipei, and while it has the same 10″ display Josh found too small, it’s also more powerful and lighter than Microsoft’s offering (and the keyboard somehow manages to get decent travel in something that’s not much thicker than most tablet covers). That’ll be little comfort to someone wanting more real estate, though, and the bigger options tend to wind up being much, much heavier – like all-in-one machines or bigger, clunkier convertibles. So I hear the need for an ultra-thin tablet that extends the work area to 13″ or more. 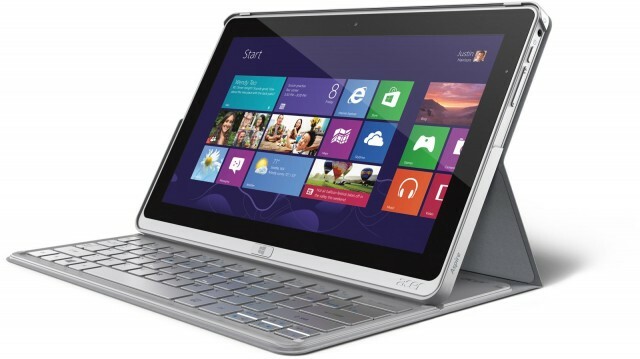 Acer calls its Aspire P3 an “ultrabook” and not a tablet, while pitching its ability to work in tablet mode. (And you can drop the cover.) It’s also lighter than the Surface Pro. What you don’t get is the bigger screen size the YouTube reviewer here wanted. But don’t be too quick to dismiss all of this. A lot of music developers rely on Windows sales as a significant piece of their pie. And these machines are coming – lots of them. I’ve been a mac user for almost 10 years now and recently learned about the new Windows 8 taking the leap into touchscreen. More or less all new windows computers are touch. Its pretty obvious from the thousands of apps that have popped up on the iPad in recent years that performing electronic music on a touch screen is fun, expressive, and kind of what we’ve all been waiting for. It just makes sense. Ive used an iPad for playing music – which I love – but can’t help but feel that Apple is purposefully limiting its potential. File management is a nightmare, and multitasking just doesn’t work. The iPad is brilliant at making sure you get all your apps, music, movies through Apple. By controlling your work/data flow, they make more money – a good business model, but not good for the creative user. Windows 8 seemed too good to be true, but nobody on the internet has been writing about it. I decided to take the leap and bought a Microsoft Surface. Best Buy has a great return policy, so if I didn’t like it, I could always return it…. Basically, I ended up loving this thing. The operating system looks great, works great, and is altogether fun to use. Multitasking and switching between programs is great, and its really fun to be able to use a pen/stylus in addition to touch (its super precise and pressure sensitive). It really feels like the future of computers. I use a new 15″ macbook pro in my studio and a new 27″ imac at work, and now it feels like a bummer every time use them. They feel outdated. Trying to use the iPad is even more depressing. There are a lot of new windows tablets/laptops out there – but there are two things that made the Surface appeal to me more: 1) it comes with a pen (which helps if you need precision – especially with such a small screen – and taking notes or drawing is a lot of fun) and 2) the kickstand. I didnt really realize how nice it would be to be able to prop up a tablet – the ipad can be annoying to use in a lot of situations because it doesnt have one. Other things that are awesome is that it supports flash (Hulu!) and has usb – so you can use external drives, midi controllers, audio interfaces, etc…. Using Reaktor is great. I personally hate having to use midi controllers whose interface bears no resemblance to the patch Im using, and touch OSC on an ipad can be buggy and you have to create templates for every patch you use and end up constantly changing your template if you change anything in your patch. I also dont want to have to take 2 computers to a show, I want a tablet up there with me and thats all. Surface does this. Reaktor is really responsive and expressive – but it doesnt support multitouch yet. I thought this would make it pointless to use on a touchscreen, but I barely notice it. There are times it would be great to use multitouch, and things could definitely get more interesting with multitouch, but even just touching one thing at a time completely blows away using a mouse/midicontroller/touchOSC. I tried using Ableton and it was super buggy with touch. You’d need a mouse, but even then, the screen on the Surface is just a bit too small. As much as I loved the Surface, I ended up returning it. My car required $1000 to fix the day after I bought this thing, and as close to perfect as it was, the screen size of the Surface is just a bit too small for performing. At 10.1 inches, it has the same problem as the iPad in that you can’t fit too much on a screen without making the controls too small. Its fine if you miss a knob when you’re working in your studio, but in a live setting, you’d want something you can reliably hit 100% of the time. Unfortunately, most of the windows tablets are around 10/11 inches – and for some reason the idea of getting a laptop sounds too old fashioned to me – I DONT want a keyboard. Im going to wait around a little bit till things like the Dell XPS 18 come out (an 18 inch tablet with a sweet kickstand thats even more versatile than the Surface’s – though doesnt have a pen) or Microsoft comes out with a second edition (rumors are that they’ll make a 14 inch version, which sounds like the perfect size for mobility, home use, and performance). In the next 6 months a ton of new computer sizes/formats will be coming out – and they’ll get cheaper. When the perfect one comes out, I’ll be ready for it. What REALLY needs to happen is that software companies need get on board. Theres not much yet that takes full advantage of multitouch. It’ll come, but its not there yet. This is really exciting – its the obvious next step in the evolution of the computer. Windows made a great new operating system, now its the software companies turn to take advantage it.